Dedication to the sport and intense training are part of each R Athletics’ Coaches resume. New coaches spend weeks shadowing classes and in skill development training. All coaches continue with monthly skill and child development instruction. R-Coaches are Safety-Certified in first-aid and CPR and have a background check on file. They will greet your child as they line up, encourage and praise them throughout the class and meet with you occasionally with updates and progress reports. R-Coaches LOVE to watch your child shine! 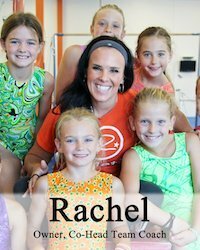 Rachel was a competitive gymnast and a State All-Around champion in her youth and has a deep love of the sport. It brings her great joy to coach athletes who participate in gymnastics. It was her dream to be able to share her gifts and talents. In 2010 her dream was fulfilled when R Athletics opened. Rachel strives to offer excellence in all areas. Her coaching staff is exemplary and the level of coaching is top-notch. Every child is taught the proper skill progressions while having fun! 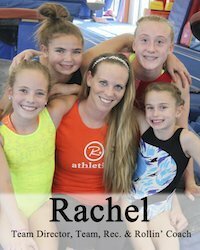 Details are important to Rachel: individual attention, monthly themes, special events, and coach-parent communication are all vital components to the success each child will experience. 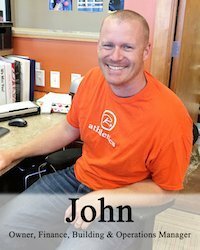 Married to Rachel Rydbeck for 16 years, John is responsible for all of the financial and operational decisions that keep R Athletics a top-notch facility. A graduate of Hope College with a Chemistry degree, he works at Infrastructural Alternatives, an environmental engineering firm, during the day and spends his evenings and weekends keeping R Athletics running smoothly. Karen is a mother of 5 grown children and grandmother of 13. She has a teaching degree in elementary education and has taught 2nd grade. She also has been the infant and early childhood director in a large church. 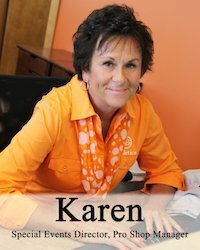 Karen was a part of the planning and launching of R-Athletics and is currently the director of birthday parties, manager of the Pro Shop and staff at the front desk. Karen’s talents also extend to creating all of the embroidered apparel and accessory items in the Pro Shop. Claire has been involved in the sport of gymnastics for 27 years. She was a nationally competitive gymnast for twelve years. 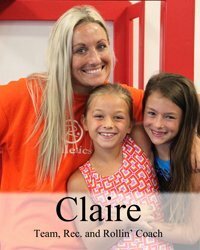 Claire has coached through all levels of the sport from Recreational through Elite. Claire has studied at both Universities of Pittsburgh and Grand Valley with a Child Psychology emphasis and is currently pursuing a Sports Science degree through the United States Sports Academy online. She loves to help children grow as athletes and individuals through her efforts. Cari grew up in Montana, but spent nearly a decade in Hawaii before moving to Michigan in 2013. 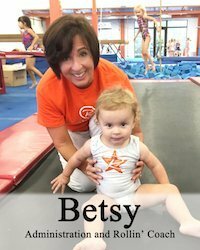 She’s been involved in the sport of gymnastics for more than 25 years as an athlete and coach. 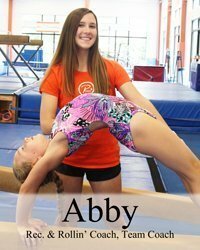 She fell in love with the sport in high school and has several USA Gymnastics certifications in Preschool and Recreational Coaching. 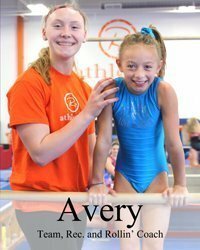 She believes gymnastics can benefit any child of any ability because in addition to teaching strength, agility, and coordination, it also develops goal-setting and social skills. She lives in Walker with her husband and very old dachshund, Maddy. 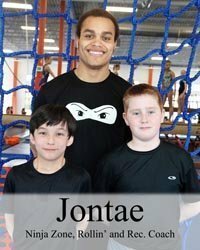 Jontae is a multi-sport athlete and has been a tricking and tramp wall artist for a year. He has worked with kids at his previous job and as a camp counselor at Camp O’Malley. And he is an excellent swing dancer! Jontae is always willing to try new things and is a vocal cheerleader for all our athletes. Kaylie was a USAG competitive gymnast throughout her childhood. She participated in competitive cheer at Grandville High School and was titled All Conference, All Region, and All State. During high school she started coaching gymnastics with her sister Rachel, who was also her former coach. 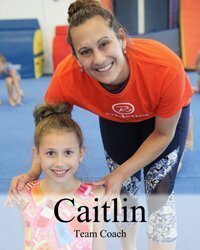 A passion was sparked and she has been coaching gymnastics for the past 8 years. Kaylie is the Rec. and Rollin’ director as well as a coach of the R-Athletics competitive team. 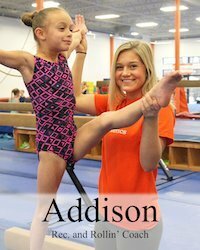 Addison has been involved in gymnastics since the age of 8. She competed four years on teams at R-Athletics and has 4 years experience in dance. Addison is a current student at Ionia high School and is taking 4 online college courses in pursuit of something in the medical field. She carries a 4.0 GPA, a member of the National Honor society and the captain of her Volleyball Team. Addison loves kids. Her favorite part of coaching is being able to be an encourager and positive role model while helping kids achieve their goals in the sport of gymnastics. Michelle was one of Rachel Rydbeck’s former gymnasts and always placed high in All Around Gymnastic competitions. In high school, she broke the school record for bars and balance beam, and was the regional bars champion and 2nd in the State on the balance beam. She was on the All Conference and All State team and named MVP. 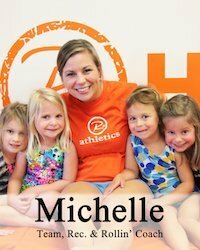 Michelle loves coaching gymnastics because she gets to be a part of every child reaching his or her goals. She loves to have fun with them and make them feel special. Rec. & Rollin’ Coach | Team Coach | Developmental Team Director. Rachel was one of Rachel Rydbeck’s former gymnasts, competing all the way up to Level 10. During her career, she was a Level 9 National All-Around Champion and also received a full ride gymnastics scholarship to Northern Illinois University. Rachel competed at college gymnastics for four years while earning a degree in nutrition and dietetics. 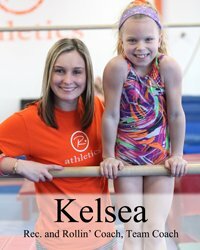 She loves coaching gymnastics because she loves seeing the joy it brings the athletes when they learn new skills. Nick has been a gymnast most of his life, and, more recently, a diver and a rower. Nick has also babysat since the age of 14 and was a teacher-cadet. He is currently enrolled in Grand Rapids Community College to study Physical Therapy and Exercise Science. 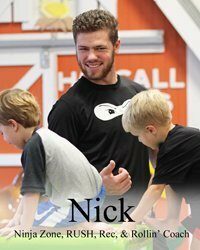 Nick loves to get the kids moving and feeling great about their skills and themselves. Francis has been involved in Parkour and Freerunning since 2016. He was a former student in our Warrior club program. Music has been a big part of his life along with movement. At two years old he pronounced that he was a violinist and has played the violin for 10 years. He has also played the tuba, piano and trumpet and participated in the Grand Rapids Choir of Men and Boys. 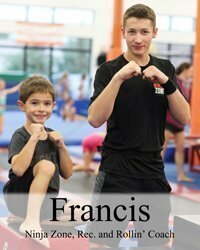 Francis loves to share his passion of movement with children and see them achieve their goals. 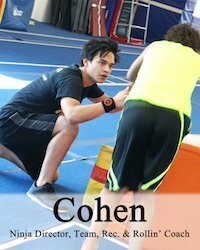 Cohen has been participating in gymnastics in some capacity since he was 2 years old. Cohen is also very accomplished in Taekwondo. He obtained his black belt at the age of 9, and his second degree black belt at 11. In 2008, Cohen was ranked third in the state and finish third at the AAU Junior Olympics. In addition to Tae Kwon Do and gymnastics, music has always been a big part of his life. 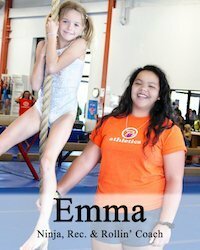 Emma has been involved in gymnastics since she was 4 years old. She placed 1st on floor and 3rd on vault in the 2013 AAU Junior Olympics and participates in the sport today with the Forest Hills Gymnastics team. Not only does Emma compete in gymnastics, but she is also a certified black belt in Tae Kwon Do. Outside of sports, she enjoys the Fine Arts such as music and drawing. In the future, she hopes to become a radiologist for Helen DeVos Children’s Hospital. As a mother of 5 children and a grandmother of 3 beautiful little girls, Betsy has spent the last 30 plus years working with children and volunteering in their schools and as an organizer of their sports teams. She is a graduate of Aquinas College with a degree in Business Management and is responsible for running the front desk at R Athletics. The highlight of her week is spending time with the babies of R Athletics. She delights in how much progress a child who is just crawling can make in a few weeks of class! Abby is a native of Grand Rapids. She was involved in gymnastics for approximately 4 years, starting at the age of eleven. In high school, she was on stage crew for her school’s plays and musicals. Even though theater took up most of her time, she always had a love for gymnastics and would go to open gyms to keep up her skills. Abby currently is a senior at Grand Valley State University majoring in Business Management. She loves to watch her athletes shine with each improvement they make! Kori has been involved is cheerleading since the age of 6. She cheered throughout her entire high school career and was voted cheer captain her senior year. 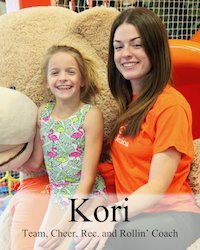 Kori loves being able to interact with the children she coaches, along with putting a smile on their faces when they master a new skill. Her favorite part of coaching gymnastics is being able to encourage students to do something they love just as much as she does. 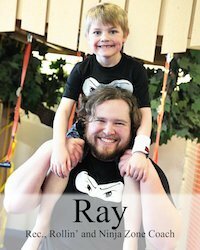 During his time at Aquinas, Ray cheered for 4 years and got his degree in music performance. He has been with R-Athletics for the past 4 years. Ray’s gymnastic skills come from his cheer background. He enjoys teaching the kids and having fun while also helping them learn. His favorite part of coaching is seeing how excited the kids are for class. 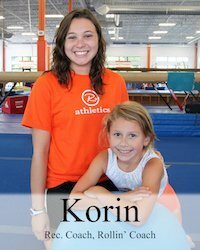 A six year veteran of the sport of gymnastics, Korin has a life-long love of the sport. In high school, she also participated in sideline cheer and her tumbling efforts greatly benefitted from her time spent doing gymnastics. She is currently attending Cornerstone University for a degree in social work and has spent her summers working as a camp counselor at Miracle camp in Kalamazoo. Taylor has grown up with gymnastics. 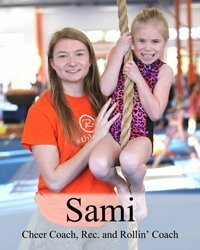 She started it at the age of two and continues today as a dedicated member of the Forest Hills Gymnastics team. Outside of the gym she is a senior at Forest Hills Eastern with plans of attending college next year and pursuing a degree in health sciences. Being in competitive, XCEL and now high school gymnastics has given Taylor a wide perspective of the sport as a whole. Her favorite part about coaching is seeing the confidence of the gymnasts improve when they reach a new goal. Sami is studying at Aquinas College and working towards her Early Childhood Education. She has also worked at e developmental center teaching 2-4-year olds. Sami has been cheering for the last 5 years. She started her sophomore year in high school and loves it! The gymnastic skills she developed during her cheerleading career are perfect for her job at R Athletics. 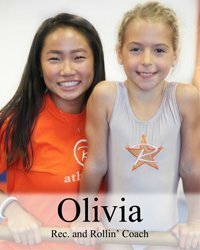 Olivia has been involved in gymnastics throughout her childhood and now competes with the Forest Hills Gymnastics team for the past two years, which she loves. She also participates in track and field. She loves spending time with kids and her favorite part of coaching is watching all the young gymnasts fall in love with the sport. It makes her love the sport even more! 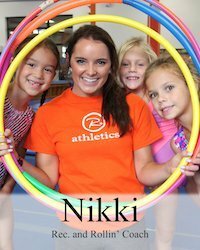 Nikki has been involved in competitive gymnastics for the past eight years. She was one of the members of the first R-Athletics team! 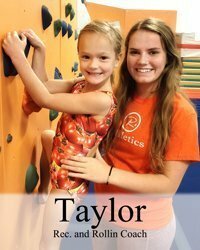 Her love of gymnastics has helped her easily transition to coaching and she loves to see the excitement in the kids’ eyes when they learn a new skill. A student at Lowell High School, she enjoys learning friends and going to the beach. 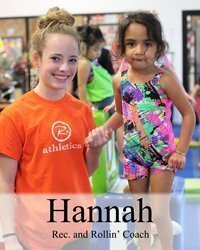 Hannah has loved and participated in gymnastics since the age of two. She competed four years on the R-Athletics Junior Olympic team. She is currently attending Wellspring Preparatory High School. Her love of gymnastics has translated well to coaching since she always wanted to encourage her teammates to improve and now she has the privilege of passing on her love of the sport to the next generation. J.J. was a USAG competitive gymnast until high school when she joined Rockford’s Gymnastics Team. She is a graduate of Grand Valley with a Bachelor Degree in Exercise Science. 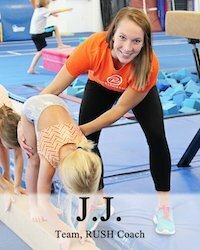 J.J has been coaching gymnastics for eight years. During that time, she has coached team, recreational and pre-school classes, birthday parties, and open gyms. The joy and excitement that children express when accomplishing new skills is why JJ loves her role as coach. They make her smile! 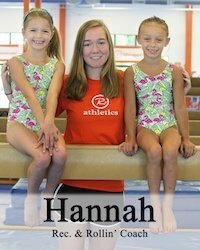 Hannah started gymnastics when she was 9 years old. 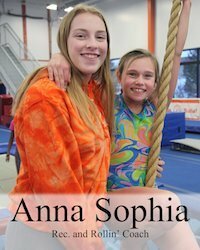 She competed for R Athletics up through Level 8 Junior Olympic and now competes for the Forest Hills Gymnastics team. She attends Forest Hills Northern and, in addition to gymnastics, she also participates in diving. Hannah loves spending time with kids and her favorite part of coaching is watching expressions of gymnasts when they learn new skills and being able to cheer them on like her coaches did for her. 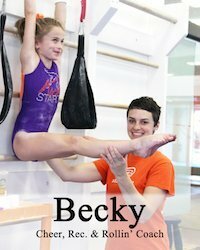 Becky was a gymnast for 6 years and a USAG competitive gymnast for 4 years. In college, she danced for 2 years and performed around Grand Rapids. She has coached team and Rec. 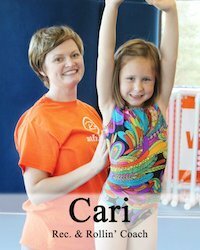 gymnastics for 3 years and has worked for 10 years with children in various positions. She is a graduate of the culinary program at Grand Rapids Community College and caters many staff events at the gym. She was the assistant coach for the competitive cheer team at R Athletics last year and coaches many of the surrounding high school cheer teams on their tumbling. Jake is a senior at Forest Hills Central. 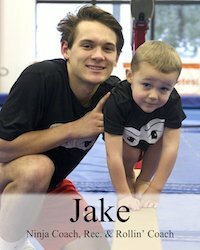 Jake grew up in the gymnastics world watching his sister compete. Along with his own gymnastics background, he is a multi-sport athlete. Jake loves to coach with a lot of energy and passion. He always makes sure the kids are having the best time.